Permits for the $175,000 interior demolition were issued last week and cyclone fencing was erected last week, blocking pedestrian access to the sidewalk on the south side of the building along Riverside Avenue. 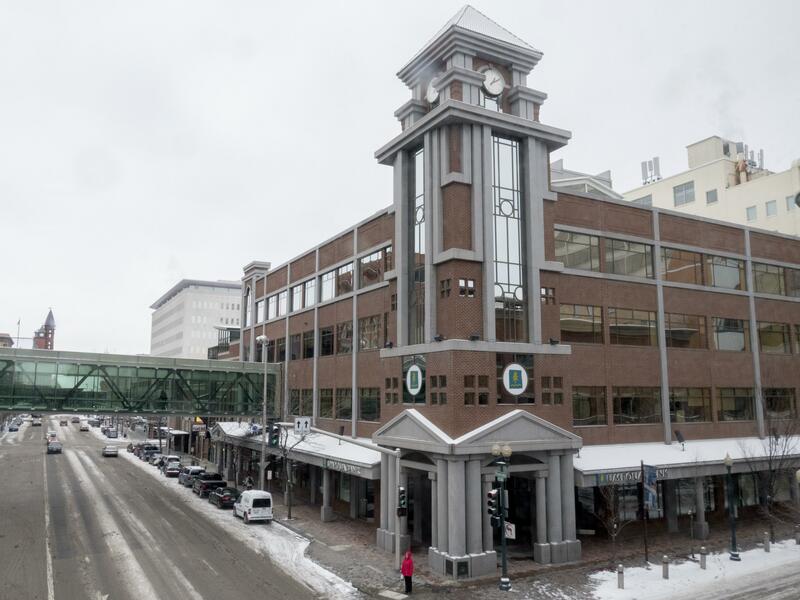 The restaurant space at the corner of Riverside and Wall Street will be called the Market Hall Eatery, and is based on a similar development in Portland. Plans filed with the city show a shared, open hall with up to 14 spaces for tenants. Unlike food courts, which generally cater to shoppers with fast-food chains, food halls house local boutique, artisan sellers. Alexander Goods Depot bought the building in September for $6.5 million and is doing the renovation work. The company is owned by Colorado-based Confluent Development, a real estate company, and InterUrban Development, which is partly owned by Rob Brewster, a Seattle-based developer who has done a number of projects in Spokane. Spokane-based Bouten Construction is the general contractor. A proposed $9 million, 125-unit apartment complex in Spokane Valley has been issued permits for construction by the city. Sprague Apartments,, just east of Conklin Road at 16511 E. Sprague Ave., will be made up of a dozen buildings and is being built by Harlan Douglass, one of the larger property owners in Spokane. Douglass purchased the 9-acre parcel in 2011 for $900,000, according to Spokane County property data. It is currently vacant land. Wyatt Architects, of Spokane Valley, did design work for the nearly 20,000-square-foot complex. Providence Sacred Heart Medical Center is remodeling its third-floor exam rooms at a cost of $788,000, according to city permit data. The remodel will allow the third floor, where the center’s Children’s Hospital is located, to accommodate new equipment. Providence Sacred Heart is a 644-bed facility employing more than 4,000 people. The Spokane hospital was founded in 1886. The project’s general contracting will be done by Spokane-based Bouten Construction. Permits for a $2.5 million, 18-apartment development in Spokane Valley have been issued by the city. The new apartments at Riverside Place at Coyote Rock, 12007 E. Coyote Rock Drive, will be in two buildings. The once-controversial development faced hurdle after hurdle before finally beginning construction along the Spokane River near the dead end of Pines Road at the river. The area is just east of the Centennial Trail footbridge over the Spokane River, downstream from Plantes Ferry Park. Developer Cliff Mort, owner of Coeur d’Alene-based Neighborhood Inc., had proposed homes between the Centennial Trail and a new road. Mort still owns the development and was issued the permits for the apartments. Published: Jan. 14, 2018, 6 a.m.